THE FIFTH LAKE "EL CINQUÈ LLAC"
This is a self-guided route through the highest Catalan Pyrenean foothills of the counties of Pallars Jussà, Pallars Sobirà and Alta Ribagorça that, although designed with true walkers in mind, demands no great technical skills. 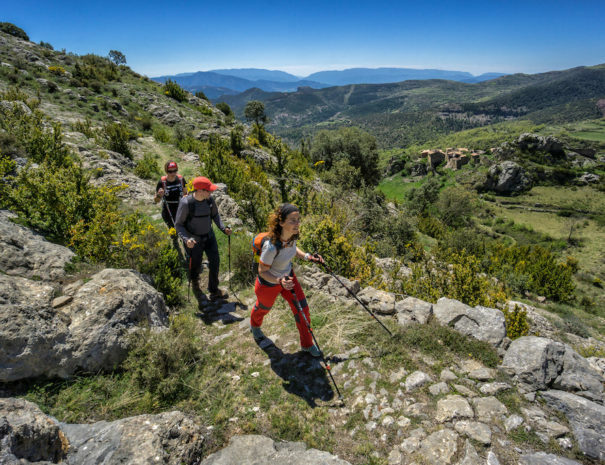 It begins and ends in the town of La Pobla de Segur, less than 200 km from Barcelona, and travels through landscapes replete with stunning scenery and welcoming human warmth. 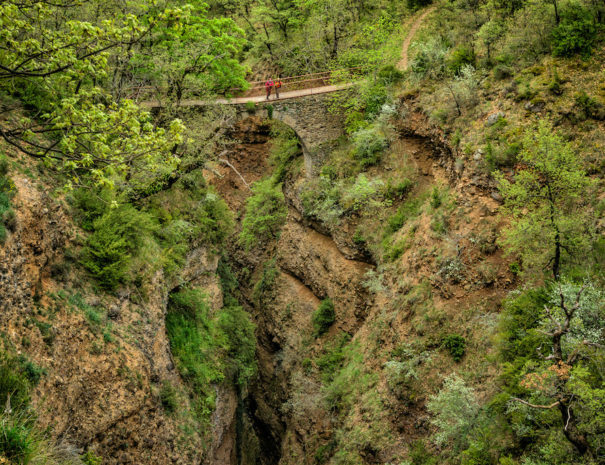 The route takes you by sleeping giants and haunted houses, to witch’s covens and across bridges built by the Devil himself. It passes through places of legend, full of mystical connotations, whose origins go back into the mists of all-embracing time; to when people spent the winters huddled around their fires as the wind-driven snow and wolves howled outside in the dark of night. The circuit takes you to numerous viewpoints and over passes that provide a glimpse of an extraordinary place, a special lake, far from the glacial corries to the north and the large reservoirs to the south, that sparkles like a bead of dew. 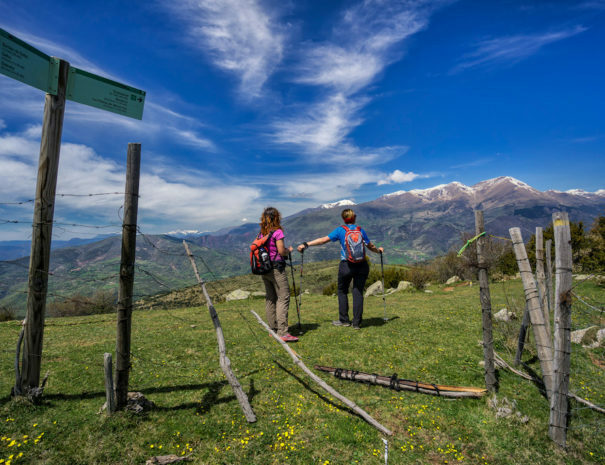 You will come to this lake, up amongst the mountains and deep valleys, on the last stage of the walk when you finally reach L’Estany de Montcortès, a place like few others. When you walk through an area such as this you can tell that it has been inhabited from prehistoric times right up to the present day. 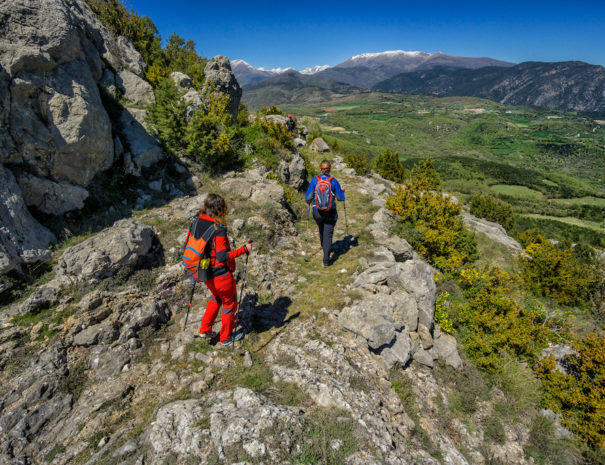 This route takes you to dolmens, small isolated churches, walled villages, monasteries, Romanesque bridges and small mountain farms and huts. You will also walk past more humble evidence of the human past of these mountains, which is becoming increasingly better preserved and respected: the dry-stone walls and shepherds’ huts built by hand with the mortar of centuries of accumulated wisdom. 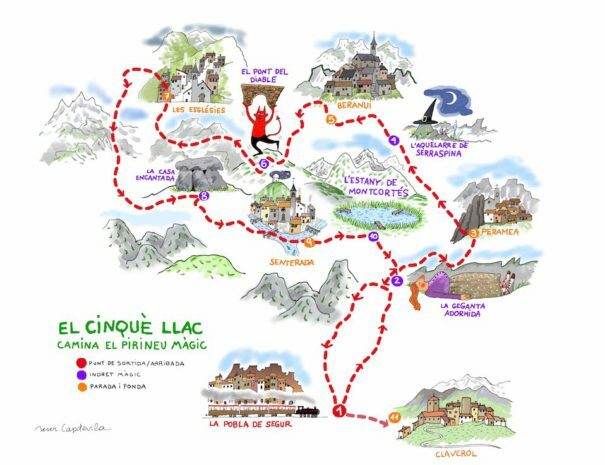 El Cinquè Llac is a route set up and run by small-scale local hostelries that believe in honest work and reflect the human side to tourism. They open their doors to visitors as a way of teaching people about the need to respect and enjoy the land, nature and the human heritage that our ancestors have left behind. El Cinquè Llac takes its inspiration from the principles of sustainable tourism: in other words, tourism should aim to improve the places people live in and, at the same time, make them better places to be visited. For example, 10% of the income from the circuit is devoted to the restoration and maintenance of the network of historical paths and trials. The whole product is designed to cause as little environmental impact as possible. The initial trip on the train, El Tren dels Llacs, encourages people to use public transport, while the cloth bundle your picnics are wrapped up in and the pannikin, for example, all help reduce waste. All the hostelries are directly involved in the conservation of the environment. One of the fruits of this commitment to the local region is the presence of volunteers both from Spain and from abroad who come to restore the area’s dry-stone walls. El Cinquè Llac was awarded the 2015 Environment Prize by the Catalan government (in the section ‘Singular Initiatives for Protecting and Improving the Environment’) and was the winner of the first Sustainable Tourism Prize in Catalonia in 2013. Those of us who run the hostelries and houses you’ll be staying in also love walking in our mountains. 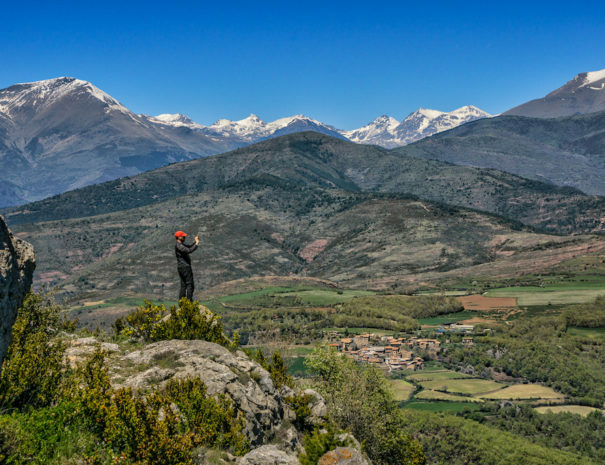 We delight in talking about our country, its villages and its paths, and help our guests discover the quintessential Pyrenees that only its inhabitants fully appreciate. At Casa Leonardo, you will be staying at the end of the 4th stage to start the fifth and last stage, well rested and relaxed.